Saturday, April 21 | 11:30 a.m. to 3 p.m.
See ticket purchase link at bottom of page. This is an adults only event. Participants must be 21 years and older. Pre-purchase is required. No tickets will be sold on the day of the event. Your ticket includes. . .
Wine Tasting: Enjoy a profusion of wines from California's award-winning vineyards. Participating wineries for 2018 include: Black Sheep Winery, Bodega del Sur, Brice Station Vineyards, Broll Mountain Vineyards, Irish Family Vineyards, Ironstone Vineyards, Jada Vineyard, Michael David Winery, Milliaire, Renegade, Stevenot, Twisted Oak, Val du Vino, Vina Moda, Wilderotter and Zucca Mountain Vineyards. List current as of 4/15/2018. International Cuisine: Savor delightful plant-based cuisine at international food stations created by Executive Chef MJ Espiritu Gerometta of Pivotal Foods, Jeff Newland of Dos Coyotes, Chef Russell Okubo of Aji Japanese Bistro in El Dorado Hills, and Miyoko's Kitchen. Shuttle Service: Visit our rescued and retired elephants, big cats and bears living at ARK 2000 and learn about their stories. Silent Auction: Dozens of items to bid on including a few treasures from the estate of PAWS Co-founder, the late Pat Derby. The "crowning" of Ms./Mr. TUSKany 2018: Which elephant will win? Vote for your favorite elephant. The winner will be announced at 2 p.m. on the day of the event. Each "vote" is $5. The story behind The Elephant Grape Stomp. . .
We held our first "Elephant Grape Stomp" in 2004 to celebrate the arrival of 71, Mara, Minnie, Rebecca and Annie to our new sanctuary ARK 2000. The five original elephants were moved to ARK 2000 shortly after our first barn (the current African barn) was constructed. The anecdote prompted Pat to try a variety of fruits which 71 occasionally ate in small quantities, but the grapes were always devoured instantly. When local vineyards pruned their vines and donated them to the animals, they became a special favorite of the dilettante baby elephant. Pat and Ed planted the first grapevines at the Galt sanctuary that year and they are still fruitful. Our first "Elephant Grape Stomp, An Afternoon In TUSKany" was celebrated in 2004 providing our donors an opportunity to visit the new facility. 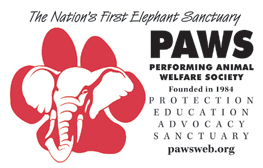 PAWS enthusiastic supporters have loyally attended the popular event which has grown in size for the past 13 years. A crowd of more than 500 guests attended the last Grape Stomp! Vote for your favorite elephant(s). . . The highlight of every Elephant Grape Stomp is always the Ms./Mr. TUSKany contest where you get to vote for your favorite elephant. The winner is "crowned" Ms. or Mr. TUSKany. The "crown" is actually a beautiful edible bouquet made of favorite elephant foods, and first and second runners-up get a tasty bouquet as well. (The other elephants each get a special treat later in the day.) Previous winners have included Lulu, Maggie and the late Wanda, with Maggie the toughest contender, winning three times. In 2014, for the first time, a bull elephant was "crowned" Mr. TUSKany. Fans of Nicholas purchased the most "votes" with one donor "spiking" the ballot box right before the final count was tallied. Needless to say all the guys attending the Grape Stomp were elated! On the day of the event. . . Yes, you can take pictures and videos, but absolutely NO DRONES allowed on PAWS' property! Click on the link below to purchase your ticket(s). Click here to buy tickets & to vote for Ms./Mr. TUSKanyIf you cannot attend this year's event but would still like to vote for your favorite elephant for Ms./Mr. TUSKany, click on the link below. Call our office at (209) 745-2606, M-F, 9:30 a.m. to 4 p.m. PST.